I know what you are thinking. "Oh look great! It's ANOTHER review of Legend. I have NOT seen a review of this one about a million times." *rolls eyes and reaches for the X in the top corner of the computer screen* Well just try to hear me out a minute before you click out of this post. I know everyone and their mom has reviewed this book and had nothing but good things to say about it. I also know that whether you have read this book or not you know/assume it's good because EVERYONE SAYS SO. I too enjoyed the book, but I think the hype got me expecting a little too much of this book. Let's just get one thing straight. This is pretty much your normal straight of the shelf YA Dystopian novel. It has a protagonist who lives in a messed up society and at the same time also happens to be different from all the rest in his/her thinking and abilities. The book switches perspectives between a boy named Day who is basically a "notorious criminal" and June who is a child prodigy. They both live in the Republic and the Republic is at war with the "colonies." I guess what disappointed me the most was the lack world building and backstory. I finished the whole first book and I do not see the point of the society's system. Why are they fighting with the colonies? I can't even explain to you who the colonies are other than saying they rebel against the Republic (but I am sure you could have already guessed that). Hopefully the next book or novella will give me a better understanding. Nothing much happened in the first about 180 pages of the book and everything that did happen was pretty predictable. I got a bit bored, but continued on because I knew it would get better. After those uneventful pages the book did pick up into the action. The story then became very engaging and suspenseful. It is interesting to me that the trend for many YA Dystopia books recently (except for the Hunger Games) is that all the major action goes down within the last 50 pages of the book. The same goes for Legend. At first I was not too keen on any of the protagonists, but I grew to like them by the end of the book. The romance was not my favorite. It felt a bit like insta-love, but it was not unbearable. The supporting characters though, were very well done. I was able to develop strong feelings towards many of the characters whether they were dead or I disliked them. Oh and that ending...that ending hurt! It left me so heartbroken and wanting the next book. Hopefully I can continue on with the series very soon. 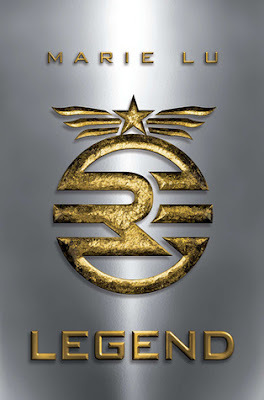 Legend as a whole was a good book and I see why many people love it even if it was not my favorite YA Dystopia book. I'm glad to see that you enjoyed this one. I loved it when I first read it but I've not gone on to read the rest of the series. Great review! Thanks! Yeah, I hope I will continue the series soon. Hopefully you will too.